Dr. Kahn emphasized the "One Health" approach to the challenges ahead. 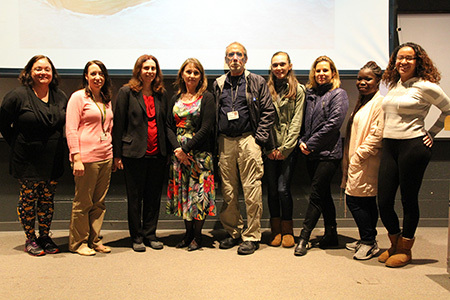 Following the presentation, students joined with Dr. Kahn, third from left, and faculty members Adena Romeo-Ratliff (Nursing), Diane Hilker (Biology), and Robert Graham (Biology adjunct faculty). 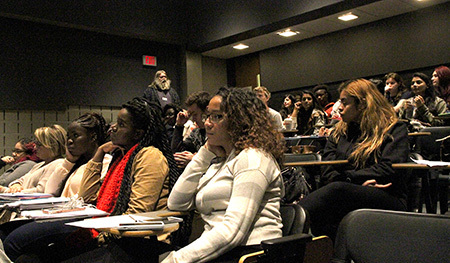 MCCC students studying in a variety of disciplines attended the lecture. 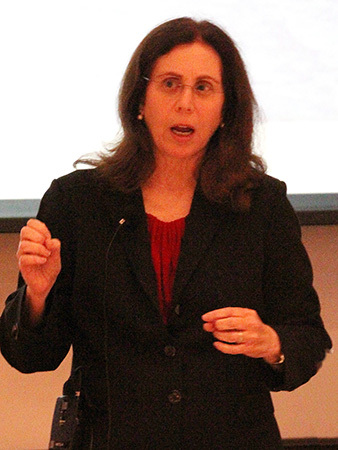 West Windsor, N.J. – In a sobering lecture entitled “Meat, Monkeys and Mosquitoes: A One Health Perspective on Emerging Diseases,” Dr. Laura Kahn, a professor in Science and Global Security at Princeton University, discussed an array of public health concerns that lie ahead for the world community. Presented as part of Mercer County Community College’s (MCCC's) Distinguished Lecture Series, Kahn spoke to a packed auditorium of students studying biology, chemistry, nursing, public health and more on Oct. 17. The professor, who is an M.D., with additional degrees in nursing and public health, noted that the need for new food sources, coupled with disease-carrying animals and climate change, will require strategic approaches and world-wide cooperation. “With intensive agriculture comes environmental risks. We must figure out how to feed ourselves in a changing climate without destroying the natural world,” she said. She noted that both domesticated and wild animals spread diseases. "Mosquitoes are often the carriers. They are among the most deadly creatures on the planet,” she said, pointing to dengue, yellow fever, and Zika and West Nile viruses, among others, that are carried by mosquitoes. Kahn predicts that the threat will only worsen with the frequency of major storms like the September hurricanes. "Mosquitoes thrive in warm, humid conditions," she said. "And, food will become very expensive as crops are destroyed." A public health crisis can arise if these diseases mutate in dangerous ways. Kahn pointed to the Zika virus, which was carried by monkeys in Uganda and later surfaced in Brazil. Once seen as a relatively benign illness, a single Zika mutation is the possible cause of microcephaly, the devastating abnormality now observed in newborns whose mothers contract Zika. Kahn noted that there is a growing movement that recognizes these challenges. The "One Health" approach is a global strategy to expand interdisciplinary collaborations and communications in all aspects of health care for humans, animals and the environment. The second annual “One Health Day” will be observed worldwide on Nov. 3. Kahn took questions from the audience at the conclusion of her talk. Clearly engaged, students asked about the future of health care, public policy and science. “We are going to have to think strategically and globally," Kahn emphasized. "There are jobs we are going to need that don’t even exist yet."